This article was originally prepared as a response to a post to the Trawler World mailing list on the subject of Twin Keels and Roll reduction. It includes a brief description of the research done by Lord Riverdale and includes a summary of the research of others on the benefits of various roll reduction strategies for power vessels and Motor Sailors. Michael Kasten. 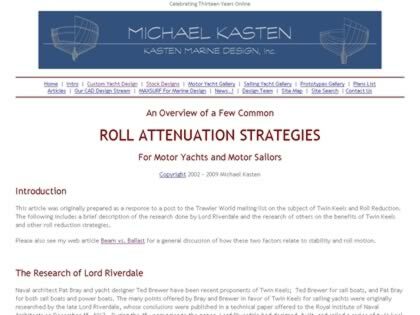 Web Site Snapshot: If available, above is a snapshot of the Roll Reduction Strategies web site at http://www.kastenmarine.com/roll_attenuation.htm as it appeared when this site was added to the directory or last verified. Please Note that Boat Design Net has no involvement with the above web site; all content and images depicted in the above thumbnail are the property and copyright of Roll Reduction Strategies unless otherwise noted on that site. Description: This article was originally prepared as a response to a post to the Trawler World mailing list on the subject of Twin Keels and Roll reduction. It includes a brief description of the research done by Lord Riverdale and includes a summary of the research of others on the benefits of various roll reduction strategies for power vessels and Motor Sailors. Michael Kasten.